Seven decades after being forced off atoll for US nuclear tests, Bikini Islanders demand fair compensation, cleanup. Lirok was one of 167 Bikini Islanders evacuated in 1946, making way for the U.S. government to explode 67 atomic weapons, including the “Castle Bravo” test of the largest nuclear bomb ever detonated by the U.S.
As a result of those tests, none of those forced off the island — both in the 1940s and following a failed attempt to resettle some years later — will be able to return again to the land of their birth. The same is likely true for their children, and generations to come. “The Bikini elders have been exiled longer than the Palestinians,” said Lani Kramer, a representative of the Bikini Atoll council-in-exile, in an attempt to put their plight in a historic perspective. The Marshall Islands, a chain of 29 atolls in the Pacific Ocean between Hawaii and Australia home to 68,000 residents, was given to the U.S. as a Trust Territory by the United Nations after World War II. The remote location gave Washington the opportunity to further test the weaponry that had brutally hastened the end of the war — once the inhabitants had been moved. 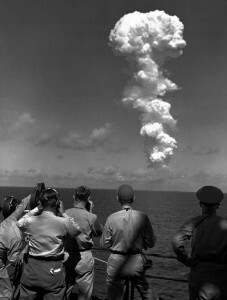 The experiments culminated in 1954’s Castle Bravo test, with a yield of 15 megatons – far more than expected. The fallout spread radiation across a wide area, blanketing nearby Marshall Islanders in a radioactive plume. More than 60 years on, the atomic tests have left a legacy of distrust toward the U.S. government. 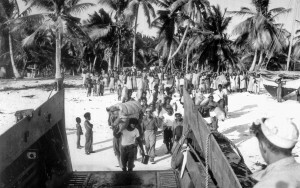 Having initially left Bikini under the impression that they would be able to return, the dwindling number of surviving evacuees is kept away by contamination that will make the atoll inhabitable for generations to come. Additionally, Bikini Islanders and their descendants accuse Washington of failing to fully compensate them for damages or pay to clean up the atoll. Bill Graham is an adviser to the Nuclear Claims Tribunal — an official body set up to compensate personal injuries and damage claims arising from the tests. He said the fund has long since run dry, with many claims still outstanding. After being forced to leave their atoll, Bikini residents were first moved to Rongerik, an uninhabited atoll not equipped to sustain a community — many of the fish native to the island were, for example, poisonous. For two years, exiled Bikinians stayed in the inhospitable, exiled home, where the lack of edible food drove them to the brink of starvation, according to Kramer. Eventually, most of the Bikinians were moved again, to Kili — a much smaller island than Bikini that is prone to flooding. It is where many still reside. Simon Jamore, 65, was born on Kili. He said as a boy, he believed one day he would live on Bikini, the home of his parents. Earlier this year, Jamore gathered with other elders at Bikini Town Hall, which is located on the capital atoll of Majuro, for a chance to tell his story. “My parents didn’t want to stay on Kili but no one heard what they said. We know that Bikini is contaminated with poison and we don’t know how long until we can go back,” Jamore said. Estimates of the cleanup cost for making Bikini Atoll habitable againrange up to $1 billion, but the U.S. Congress was told in 2010 that a tribunal set up to represent exiled Bikinians had suggested a method priced at around $250 million. Kramer and her mother were also born on Kili, but they likewise dreamed of going to Bikini Atoll, the island of their ancestors. In lieu of a return, many survivors said they simply hope for fair compensation. But even that has been hard to come by, campaigners say. “Some Bikini elders went to the U.S. government, saying give us more money and food and take us to good hospitals in the U.S. because we have bad things inside like cancer,” Jamore said, adding that four family members including his mother had been diagnosed with cancer. Many Marshallese from Bikini and other nearby atolls were exposed to radioactive fallout from the nuclear tests — especially from the Castle Bravo detonation, a hydrogen bomb estimated to be 1,000 times more powerful than the bomb that destroyed Hiroshima in 1945. Bravo sucked up trees, sand, rocks and water into a fireball that lit up the sky, irradiated the material and threw it 100,000 feet into the air before it cooled and produced widespread radioactive fallout. Others became ill after returning to Bikini having been told in 1968 that it was safe to go back. Three extended Bikinian families did return in 1972, but by the end of the decade they were forced to leave for a second time after high levels of radiation were detected on the atoll and it was again deemed dangerous for people to live there. 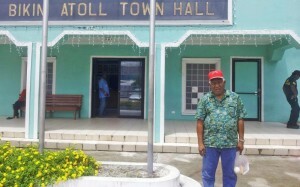 To compensate for personal damages, the Nuclear Claims Tribunal was established in 1987 with a $150 million trust fund for the Marshallese, Graham said. The young and inexperienced nation was expected to invest that money so that it could pay out an annual $18 million for damages from interest generated on the fund so that it would last in perpetuity, he added. But less than a year into the fund’s existence and just after it was fully invested, the “Black Monday” stock market crash occurred and the fund lost millions, said Graham, who became the public advocate for the Tribunal in 1988 with a legal responsibility to prepare and present the claims. “It was just mission impossible,” Graham said. Even if the fund had been able to generate the necessary interest, the agreed upon settlement was never going to be enough to compensate the damages, Graham added. “This was a radioactivity lab they were putting subjects into,” Graham said, adding that very little was known at the time about the long-term effects of radioactivity on humans. The U.S. studied the effects on Marshallese victims in the years that followed, especially looking at residents of Rongelap — who were located in the path of the Bravo fall out and were subjected to higher levels of contamination than any other people at the time. After concluding that the extent of damages far outweighed the compensation, the Marshall Islands went to the U.S. Congress to ask for more compensation in 2000. They received no response, Graham said. The Tribunal’s funds were depleted to the point where it was no longer useful by 2009, when Graham retired. About 2,000 claims, from skin burns to hair loss, had been compensated — but many claims remained outstanding, he said. “It’s very depressing,” Graham added. Graham decided to stay on part-time at the Tribunal’s office, the rent being paid by the Marshallese government in order to keep it open as a record of unpaid claims. Stacks of uncompensated claims could be seen in boxes piled high around the office. “Where we are now is kind of in limbo,” said Jack Niedenthal, trust liaison to Bikini Atoll — a position meant to coordinate U.S. funds to compensate Bikinians for the nuclear testing and to facilitate the cleanup of Bikini Atoll. By 2009, the Nuclear Claims Tribunal had awarded more than $2 billion for personal injury, property loss and class action claims — far exceeding the $150 settlement amount agreed under the Compact of Free Association. Bikinians took their case for more compensation to the U.S. Court of Federal Claims in 2006, but the court rejected the claim saying the Marshall Islands and the U.S. had already reached an agreement over claims. The court added that they could seek additional compensation from Congress. In a 2012 update on its website, the U.S. Embassy for the Marshall Islands noted that a 2000 petition for additional compensation on grounds of “changed circumstances” remains pending before the U.S. Congress despite the White House already concluding that it did not meet the requirments needed under the original agreement. The State Department did not respond to Al Jazeera’s request for comment at the time of publication. “It’s a feeling like banging on a tin cup — a feeling like begging,” Niedenthal said, adding that the lack of compensation was unjust considering how much the U.S. owed the Marshallese. “It stuns me that they can treat us like this,” Niedenthal said, adding that representatives from Bikini go to the U.S. Congress once a year “to remind them” that they are still seeking fair compensation. Marshall Island Foreign Minister Tony DeBrum said the government is putting together a revised approach to reopen the case for compensation based on new scientific research that shows the damages far exceeded what was originally thought. In a parallel effort, DeBrum has championed the filing of two lawsuits, one in the International Court of Justice (ICJ) and another in U.S. Federal District Court, suing the U.S. and eight other nuclear-armed countries for failing to disarm. “We have pledged to the people that we will not let an opportunity go by — that we will stop this madness,” DeBrum said. The case in the ICJ is ongoing. The U.S. dismissed the case on jurisdictional grounds in February, but the Marshall Islands appealed in the U.S. Ninth Circuit Court of Appeals in April. Meanwhile, many of the original 167 Bikini residents have died in exile. “Time is running out, my grandmother turns 82 this year and she’s never gone back. What can we do before she passes on? More leaders of the original 167 have passed on — I want closure,” Kramer said. “I want the U.S. government to apologize to my grandmother and all the people for years and years of suffering,” Kramer said.